As a single parent, Carlos wants the opportunities for his son he never had. He wants to keep him off the gang infested streets and wants him to attend a school where education is more important than policing children. As an illegal immigrant, providing these opportunities is a very trying and tiring experience and when Carlos's work truck is stolen he must risk everything in order to find it without involving the police. On the surface "A Better Life" is a compelling drama about a father and a son. Focusing on a father trying to teach his son to be a better man. Underneath that tried and true theme however is a much bigger story of a illegal immigrant trying to remain invisible in East Los Angeles while also providing for his son. This is a political drama without ever standing on a soapbox. The story is divisive in that it has a message it is pushing on its audience, but at the same time it never becomes the bleeding-heart that you could expect from a drama with ulterior motives. This is instead a poignant story of what continually happens in the United States. It is a political hot spot that causes plenty of debate on both sides of the topic, however this film presents the situation (or controversy) in the simplest of terms, raw human emotion. Placing the audience in the plight of Carlos and his son Luis forces the audience to undergo the experience. Forget for a moment your own political viewpoints and preconceived beliefs and just think as a human. "A Better Life" aims to strip away all of the armor and give us the human experience of an illegal immigrant. It is not the most comfortable experience to undergo, it is tiring, disheartening and painful but it opens our eyes to a situation that goes on every single day in America. It reminds us of universal desires that all human beings crave. We all want a better life (for whatever reason) and the United States still stands out as a beacon for that goal to millions around the world. The experience created in "A Better Life" hinges on the commanding lead performance by Demián Bichir as Carlos Galindo. Bichir delivers an absolutely riveting portrayal of a father willing to risk everything for his son. His performance is quite an oddity because he plays an absolutely invisible character however the outcome is a stand-out and award worthy performance. From frame one Bichir pulls you right into Carlos' exhaustion due to his back breaking work. You see the willpower in his eyes, you hear the temperance in his voice and feel the desperation in his actions. In real life, the character Carlos is one that some will sneer at when seen on the street but through the emotions and events of this drama those ill formed stereotypes should be washed away by compassion of the human spirit. In a father and son drama it is critical that the audience buys into their relationship. Luckily the production team for "A Better Life" found newcomer José Julián, who is exceptional in the role of Luis Galindo. Julián really feels natural in all of scenes opposite his onscreen father and friends at school. The character of Luis represents such a critical time in young men's life and because he is growing up in East Los Angeles he is even more susceptible to pressure to join a gang. The "A Better Life" script written by Eric Eason magnifies these notions by having Luis's romantic interest being apart of a family of gang members. While the film never demonizes the gang members or the their family, the message of influence is clear. José Julián does a fantastic job portraying the tug-of-war he must play with the gang mentality lifestyle and the life his father wants for him. The learning process Luis Galindo goes through is just as important to the film as the political backdrop the story also encompasses. "A Better Life" is a small film but it doesn't feel that way with all of the talent helping it along. 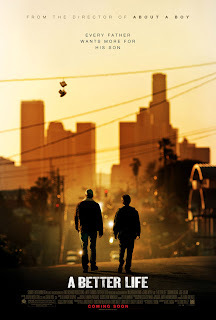 Director Chris Weitz got incredible production value shooting in and around Los Angeles. Javier Aguirresarobe's cinematography is exceptional throughout. His camerawork tells half the story for director Chris Weitz. He is able to set up angles that add emotion to scenes already dripping wet with emotion. Editor Peter Lambert also allows for Aguirresarobe's cinematography to have influence on the storytelling. Together they allow the scene to happen thereby allowing the audience to feel the experience and emotions on display. Finally "A Better Life" is a film I went into thinking I wouldn't enjoy. Having seen the trailer I knew the outcome and questioned what more did I need to see. Having seen the film I know I was dead wrong. The film never intended to be about the outcome, but instead opening our eyes to the human emotions behind the experience. The condition and political debate are exactly what they are and this film does not aim to change that but it does house emotions that we all share equally.